Today’s post will describe China’s green building evaluation standard and compare it the US Green Building Council’s LEED rating system. Our country is now in the phase of rapid economic development, ranking world No. 1 in terms of annual building volume, with significantly growing consumption of resources year by year. Therefore, scientific development philosophy must be steadily created and seriously implemented, and the concept of sustainable development must be adhered to, to strongly develop green buildings... The purpose of formulating this standard is to regulate evaluation on green buildings and promote the development of green buildings. The evaluation system, introduced in 2006, is credit-based, and allows developers to choose which credits they want to pursue. Considering current construction market in our country, this standard will mainly evaluate residential buildings that are huge in quantities and public buildings that consume much energy and resources, like office buildings, mall buildings and hotel buildings. For evaluation on other buildings, this standard can serve as reference. A seventh category called “Preference items” contains strategies that are both cutting-edge and harder to implement, such as brownfield redevelopment, more than 10% on-site renewable power generation, etc. Those familiar with the LEED rating system will notice many striking similarities between LEED and the China standard. First, both are credit based systems rather than command and control systems. This gives the developer maximum leeway over what credits they wish to pursue, although some critics of LEED have said this reduces the level of sustainability in LEED rated buildings. China’s system does have more prerequisites (32 in residential, 26 in public buildings) than LEED (7 in LEED for New Construction [PDF]). Second, the categories are almost the same, save for the Three Star's additional operations and management category. Moreover, the credits within those categories are very similar; things like minimum energy performance, water savings, local materials, and others are seen in both systems. Third, the rating categories are very similar: 1-, 2- and 3- stars in the Chinese system and Certified, Silver, Gold and Platinum in LEED. Evaluation on newly built, expanded or reconstructed residential buildings and office buildings, mall buildings and hotel buildings belonging to public buildings, shall be conducted in one year after turnover to the property owner. I think this is a good idea for China, because it requires real, measurable reduction. One complaint about LEED is that many credits are based on energy savings predicted by energy modeling, rather than actual certified energy savings. Although New Buildings Institute data [PDF] shows that on average, the models accurately predict energy savings, this can vary widely on a building to building basis. The Three Star System remedies this by basing results on hard data, and collection of this data may be an important first step toward better measurement of building energy use in China. However, I worry that this post-facto certification process could slow the market transformation that LEED has driven so efficiently in America. The LEED Core and Shell system allows developers to submit their design and achieve “pre-certification”, which they can then market to prospective tenants before the building is built. This allows developers to capture some of the benefits of going green by getting higher rents and faster lease up and ultimately drives more developers to build green. Luckily, LEED and China’s Three Star System can work together and complement each other quite nicely. This will allow developers who want to get the marketing benefits of green to pursue LEED Core and Shell pre-certification and then ensure that the predicted energy savings were achieved by going for Three Star certification. I really don't see LEED or other international green building standards as "competing" with the MOHURD [Three Star] green standard. The real competition is with the standard non-green developments. The MOHURD [Three Star] green standard is more geared for the Chinese market and should appeal to a broader base of developers than LEED. However, key segments of the market are demanding LEED and everyone agrees that the market should not be interfered with. I also believe that, as the cost to certify comes down, I expect the reach of China's green standard and LEED to expand. Watson expects to pursue both the Three Star standard and LEED standards on the projects he works on in China. All in all, the Three Star System seems to be a good start for China’s nascent green building market. As the market begins to accept this system, I hope we will see the Three Star System begin to gain popularity and become much more widespread than LEED, which still remains almost exclusive to Class A office and luxury apartment development. After all, for China to get serious about green development, all buildings will have to be green, not just those at the top end of the market. Hopefully the Three Star System will eventually help make the Chinese real estate market greener, healthier and more prosperous. Is the one year, post-completion certification contingent upon supplying the certifying body with actual energy performance data? I should think it would be. This is a huge difference between LEED and 3-star. Actual performance is never the same as designed performance. In many cases, actual performance is worse. This is why the 3-star system should actively promote this difference as an "edge". 3-star buildings can give prospective tenants actual energy use data certified by a 3rd party as opposed to design energy use data. Thanks for the article, Geoff. Looking forward to future posts on this topic. Thanks for your tough but fair comment. I have read Gifford's critique and did link to it in the post. I will not address the statistical questions, but rather agree with you that energy modeling has it's problems, and therefore basing the most important of the LEED rating system- energy savings- on modeling is a scary proposition. That being said, I think the pre-certification aspects of LEED CS are incredibly important. Let's face it, most developers are only going to build green because they can make money doing it. When a developer can market a building under construction as precertified for LEED, they can actually make money through faster lease ups, higher rents, etc. This encourages more developers to go for LEED, which is undoubtedly a good thing. LEED precertification is even more important in China, where greenwashing is prevalent. The third party stamp from the USGBC is worth it's weight in gold, and allows developers to shop the building as a green building to multinationals with CSR policies to occupy green space or others interested in sustainability. 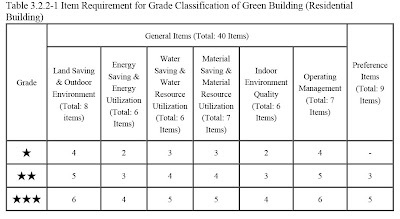 I find it incredibly hard to believe that a multinational would be willing to pay any more for space in a building pursuing an MOC green rating, since the rating won't be given until a year after occupancy begins. Now, again, this is not to say LEED is perfect. There needs to be some way to balance the precertification benefits with measurable reductions in energy use. That's one reason I like pairing LEED CS with the MOC rating tool: you get the precertification marketing benefits of LEED as well as the MOC rating tool confirmation that energy savings were indeed achieved. I also hope we see some changes in LEED that allow for more credit given to hard, verifiable energy (and emissions) reductions. I hope that the carbon weighting scheme in LEED 2009 will help by putting more focus on the EA categories. If you'd like, I have an analysis comparing LEED NC 2.2 to LEED 2009 that I could forward to you. Is there any more information about how one actually goes about documenting and applying for the Three Star certification. The documents you linked to do not seem to go into that level of detail. Looking at the evaluation methods listed for many of the criterion, there doesn't seem to be a parallel submittal requirements which are so key to LEED submittals. Go and Go its really close to be perfect! Keep up the excellent work. I love your system. Thank you very much for your informative site! I am a Chinese architect/urban planner working in the Netherlands and China. I came across your site when searching for the different standards. By looking through the different GB standards, I have the impression that LEEDS is more orientated on performance of single buildings, while the European standards such as the BREEAM is more focused on the urban level, community impacts, water system impacts, traffic etc.